Welcome to the Walled Lake Central High School Student Activities portion of Lakes Valley Conference! Here are some highlights from the Walled Lake Central High School Student Activities and Leadership groups. Enjoy! GO VIKINGS! Walled Lake, MI – October 17, 2017 – Walled Lake Central High School recently celebrated its Homecoming on Oct. 13 with a wide variety of activities. WL Central hosted Waterford Kettering High School for their Homecoming football game. The Vikings were victorious by the score of 52-36. Chris Hamama and Sophie Colvin were named Homecoming King and Queen. This year’s Homecoming theme was “Animal Kingdom”. For more information, contact Judy Evola at judyevola@wlcsd.org. The Passion for Life 5K run/walk and five mile run recently took place around Walled Lake with over 600 participants supporting braving the wind and rain for the organization’s 10th annual event. This year’s event brought in $35,000 for Mott Children's Hospital, the McEwen Family (2017 Inspirational Family), and all of the organization’s previous Inspirational Families. The Walled Lake robotics team brought home the winning banner this weekend at the FIRST Robotics Lansing District competition. In an Alliance with Grand Rapids team 3357 and Goodrich team 494, Walled Lake team 308 battled through the quarter and semi-final elimination rounds to compete in the final against Whitmore Lake team 3668, Jackson team 2611, and Lake Orion team 302. Hampered by breakdowns ranging from drive motors to mechanical winch issues, the Monsters held it together until the very end with a final round alliance win of 272 to 262 points. 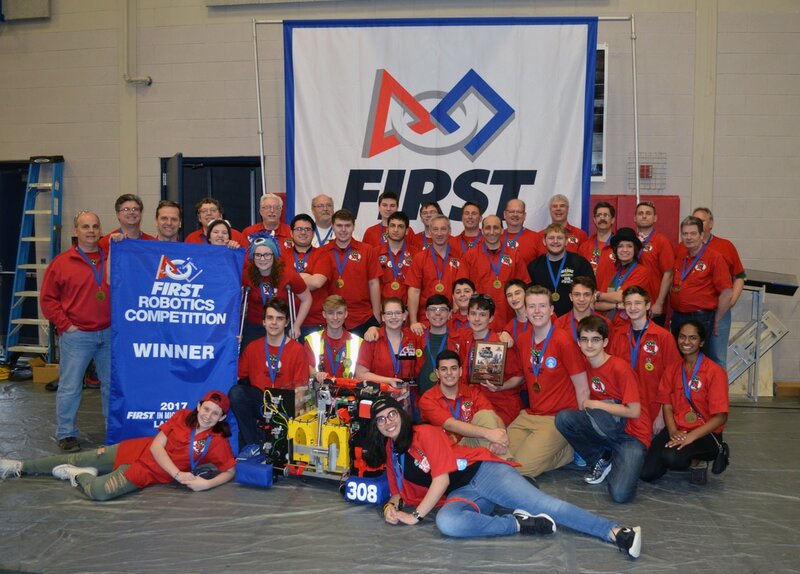 Congratulations go out to all of our robotics team members from Western and Central High Schools in this amazing victory! 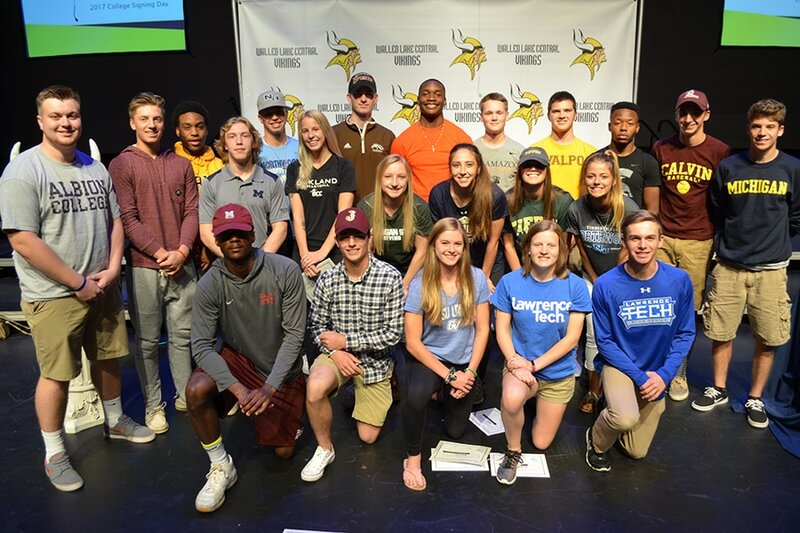 May 23, 2017 – Walled Lake Central High School hosted a College Athletic Commitment event for 22 student athletes that plan to pursue athletics at the collegiate level on May 19. These 22 athletes are: Amanda Britain, Cooper Dundas, Damien Felton Jr., Matthew Ford, Ben Freeman, Kayla Guldan, Jack Gulvas, Drew Henig, Jared Hill, Jeannee Hill, Nick Jovanovski, Morris Kirkland III, Amanda Ling, Zack Norgrove, Lexie O’Dette, Warren Stanfield III, Brett Strongman, Dominic Vigliarolo, Lauren Wasiak, Kyle Weir and Lindsey Willis. Amanda Britain is the daughter of Kim and Graham Britain. She plans to attend Mount St. Mary’s University to play soccer. Cooper Dundas is the son of Melissa and James Dundas. He plans to attend Western Michigan University to play baseball. Cooper intends to double major in entrepreneurship and sales & marketing with a minor in media while in school. Damien Felton, Jr. is the son of Demetria and Damien Felton. He plans to attend Adrian College to play football. Damien intends to study architecture while in school. Matthew Ford is the son of Darlynn and Timothy Ford. He plans to attend Kalamazoo College to play football. Matthew intends to study biology while in school. Ben Freeman is the son of Nancy and Alan Freeman. He plans to attend the University of Michigan to join the wrestling team. Kayla Guldan is the daughter of Kristy and Doug Guldan. She plans to attend Oakland Community College to play volleyball. Jack Gulvas is the son of Melissa and Michael Gulvas. He plans to attend Northwood University to play baseball. Jack intends to study business while in school. Jared Hill is the son of Jodi and Tim Hill. He plans to attend the University of Michigan to run track and cross country. Jared intends to study engineering while in school. Jeannee Hill is the daughter of is the daughter of Jodi and Tim Hill. She plans to attend Grand Valley State University to run track and cross country. Jeannee intends to study biology while in school. Drew Henig is the son of Jenni and Thomas Henig. He plans to attend Jackson College to play baseball. Drew intends to study radiation therapy while in school. Pierson Hoy is the son of Rebecca and Peter Hoy. He plans to attend Schoolcraft College to play baseball. Pierson intends to study business administration in school. Nick Jovanovski is the son of Tahnya and Robert Jovanovski. He plans to attend Albion College to play football. Nick intends to study criminology while in school. Morris Kirkland, III is the son of Metima and Reginald Kirkland. He plans to attend Morehouse College to play baseball. Morris intends to study mass media while in school. Amanda Ling is the daughter of Kathie and Daniel Ling. She plans to attend Michigan State University to join the diving team. Amanda intends to student secondary education while in school. Zack Norgrove is the son of Lori and Michael Norgrove. He plans to attend Kalamazoo College to play lacrosse. Zack intends to study business marketing while in school. Lexie O’Dette is the daughter of Tammala and Robert O’Dette. She plans to attend Northwood University to play golf. Lexie intends to study business while in school. Warren Stanfield, III is the son of Maria Stanfield and Warren Stanfield, Jr. He plans to attend Michigan State University to join the wrestling team. Warren intends to study political science while in school. Brett Strongman is the son of Krista and Scott Strongman. He plans to attend Valparaiso University to join the swim team. Brett intends to student meteorology while in school. Dominic Vigliarolo is the son of Jolene and Frank Vigliarolo. He plans to attend Lawrence Technological University to play soccer. Dominic intends to study architecture while in school. Lauren Wasiak is the daughter of Lynne and John Wasiak. She plans to attend Lawrence Technological to play soccer. Lauren intends to double major in industrial engineering and physics while in school. Kyle Weir is the son of Kelly and Jeff Weir. He plans to attend Calvin College to play baseball. Kyle intends to study secondary education focusing on history and mathematics while in school. Lindsey Willis is the daughter of Debbie and John Willis. She plans to attend Tiffin University to play lacrosse. Lindsey intends to double major in criminalistics and law enforcement while in school.